Directions: Read the story below. Then, remember what happens in the story to answer the questions. To print, highlight the text section, then right click and choose "print selection. If you don't mind printing the images, you may also select file, then print. Some systems may require that you copy/paste the text into another program before printing if you choose to leave out the images. Marge woke up happy. It was Saturday. Today was going to be great. She would get a new hat today. Marge was very excited. She could hardly wait. While she put on her best outfit, she wondered what kind of hat she would pick. There were two hat stores in the mall she was going to. Marge was excited about more than the hat. This would be the first time her mom would trust her to go to the mall alone. She wouldn't exactly be alone. Her friend Sinda was coming, too. Since Marge was turning 12 on Sunday, her mom told her an early birthday present was for Marge to go to the mall and pick a new hat. Her mom said that since Marge was growing up, she might be able to trust her to do more grown-up things and shopping was one of those things.But, she had to bring a friend because, like her mom always says, "Safety Comes In Numbers". Marge had never gotten ready so quickly before. She dressed and ate the eggs, pancakes, and fruit her mom had left her all within 15 minutes. That was a new record. Quickly gulping her milk down, she dialed Sinda's phone number, but before she started to hear the ring, the doorbell rang. It was Sinda. Sinda was just as excited as Marge. It was also the first time she would be trusted. Marge and Sinda rushed out the door, remembering to lock up the house and to take along their personal alert systems that would make a loud sound if anyone bothered them. They walked two blocks to the bus stop and waited five minutes before a bus pulled up. They looked at the screen on top to make sure it said 65. Number 65 was the bus to the mall. It said 65, so they got on. Sinda watched for their stop while Marge watched out for strangers. As the bus pulled into the mall stop, Sinda and Marge stood up and held onto the safety poles. When the bus stopped, they got off carefully and walked straight to the mall, making sure to watch the strangers. Once they were inside the mall, they went straight to the first hat store. They wouldn't have to go anywhere else. Marge spotted the perfect hat. On the back of the page (or on a seperate paper), write the ending to the story. It should be a happy ending. Start with what happens after Marge sees the hat. My homeschooling philosophy always has been about being sure the kids learn, as well as have fun during the educational process. To keep the kids with an open mind to learning, I often mix their interests in with the lessons. If you've got a kid who loves basketball, but is not quite as into vocabulary as you'd like, try this free vocabulary lesson plan on beginning basketball terms. It works just as well on a child who does like vocabulary, but also likes basketball. In this free homeschool lesson plan, the child will learn the definitions of popular basketball terms. The purpose of this lesson is to practice important language skills, as well as broaden the scope of learning with non-traditional vocabulary words. This also is a great lesson for kids who are interested in playing basketball, as it teaches them the terms they will need to now. To teach this lesson, you will need a basketball and basket, paper and pencil, a print-out of this lesson, a separate printout of just the terms for the homeschool student. The terms can be crossed off as they are used. The child will be using a separate sheet of paper for each set of terms. To print only the terms from this article, first visit the print page by clicking on the print option icon. Next, highlight the terms, click "file," then "print," and then tick of "selection" and click "print" or "ok" in the print options box that pops up. The child should read aloud the term and look up the definition. Have the child repeat the definition aloud. Next, you and the child can act out the term together, using the basketball. If you don't have a basketball net at home, try a nearby park or school playground and look up the terms in advance. For terms that are in reference to an object, rather than a part of game play, show the object. The child should then study the terms on his or her own and be tested the following week. For fun, the test can include writing out the definition, as well as acting out the term where applicable. These terms should be broken up into groups of about 10 - 15 per week. Mixing a child's interests, such as basketball, with education can create a receptive learning environment. If the kids have asked you about the cat's eyes, homeschool lesson time is the perfect learning opportunity. Even if they haven't asked, learning how cat eyes work is a great science lesson. This free animal lesson plan on how cat eyes work can be used before or after other vision lesson plans, as part of a unit on animal vision, or even on its own. Much of this will be understandable for even younger kids, but older kids may also benefit from the lesson. This is very adaptable for a mixed-age classroom setting. The first part of this lesson involves reading the text below as a group reading lesson. Those able to read can take turns reading this below paragraphs about how cat eyes work aloud. You may want to print a copy of the selection for each child to make it easier. The words in bold can be used as vocabulary words. A printout on cat eye anatomy can be looked at for reference as well. Have you ever wondered how a cat's eyes work? Why are their eyes shaped differently than yours? Why do cat eyes seem to glow in the dark? Is a cat's vision better than yours and why is it so hard to sneak up on a cat, even in the dark? 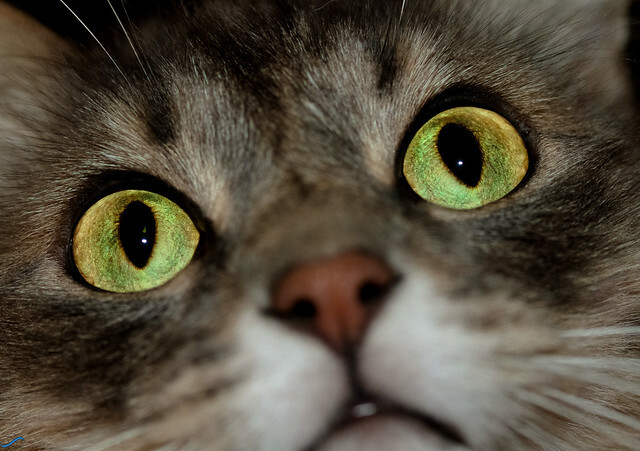 If you look at a cat's eyes, you will notice that the black center, or pupil, is shaped differently than yours. It might be shaped liked a slit or it might be a large round circle. The shape changes, depending on how much light the cat needs in order to see. When it's dark, a cat needs more light to see, so the pupil dilates, or gets bigger, to bring in more light. When this happens, it might look like a cat's eyes are glowing because of the light. There actually is something called the tapedum lucidum positioned behind the retina of a cat's eye. It works like a mirror to reflect the light. In the daytime, a cat's eyes don't need to bring in as much light because there is already plenty. During this time, a cat's pupils will be slitted. Even though cats can see better in the dark than humans and even have a greater vision field at the sides of the eye, the clarity of their vision is poorer. Cats don't need as much light to see as we do and can even see moving objects at a greater distance. However, their vision is more blurred than ours. They also cannot see colors as well as we do. You might compare the focus of a cat's vision to a human with colorblindness and with a need for reading glasses. So even though you might wish you could see as well in the dark or have glowing eyes like your pet cat, you might think twice when you realize that in order to have that benefit, cats also have to give up seeing some color and detail. Once the above reading is done, ask students leading questions about what they've read. Discuss together the facts, as well as benefits and drawbacks of how a cat's eyes work. Try to get the students to explain in detail why they would or would not like to have vision like a cat. Give the students each two sheets of black construction paper and one sheet of yellow. Ask the students to cut out three pairs of cat eye shapes from the yellow paper and paste them onto one of the black. With the remaining black paper, ask the students to cut out shapes of a cat's eyes slitted, medium dilated, and fully dilated. 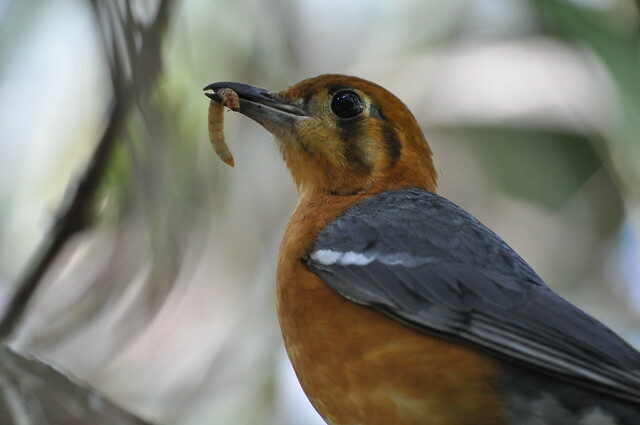 In this lesson plan, students will learn to understand the difference between predator and prey. This can either be a follow-up lesson to my previous lesson plan on the food chain or it can be used on its own. Either way, this lesson will instruct the children on predators and their prey. The italicized section should be read aloud to the student/s. Afterward, allow a question and answer period. A predator is an animal that hunts other animals for its food. The prey is the animal that the predator eats. For example, hawks hunt and eat snakes, so hawks are the predators of snakes and the snakes are the prey. An animal food chain is made up of predators and prey. Here is a short story about predators and prey. The quiet mouse munches on some crumbs a human has left in the grass, when a snake swiftly catches him with one lick of its powerful tongue. The snake slithers away to hide in the tall grass. A hawk swoops down from the sky overhead and easily captures the snake and flies off to the nearest high point, which happens to be a mountain top. A sly fox is napping nearby and when he awakes, he is hungry. He senses the hawk's presence and captures him in no time. However, a leopard, high in a tree, quickly discovers the fox and pounces down on him. As you can see from the paragraph above, predators can also be prey, depending on the situation. This is where you start the question and answer period. Once each student has had a chance to list a predator and prey, have the students complete the art project below. Once each student has their materials, instruct them to draw a predator vs. prey food chain. The food chain should include at least 5 animals. The animals should be drawn in order and have connecting lines or be numbered. The children should write each animal's name below it, so that there is no mistake of what the animal drawings represent. The children should color their animals as well. Each animal should be labeled as predator or prey. Some animals should be labeled as both. Be sure to explain that to the students. Once the children are finished, their projects should be checked and graded for accuracy. Afterwards, the projects can go on display. Preschoolers learn well by using hands-on lessons that are also fun. In the lesson below, parents or teachers will be able to apply hands-on learning and fun to introduce the world of worms to their preschoolers. From singing a song, to touching the worms and even doing a worm craft, preschool aged children will have a fun and educational time learning their worm facts. Sing this fun song to the preschool children. Have them repeat it after you a few times. Then, sing it together. This should be sung to the tune of "Where is Thumbkin"? Use of this simple song will prepare the children for later, when they will see and feel the worms. Have you seen a worm yet? Lesson 2: Let's Learn About Worms! Here is a fun paragraph you can read aloud to your preschoolers. This will teach them a few facts about the worm. Make it fun by acting out the words with motions and movements. Worms are amazing creatures. Did you know that worms can help people? It's true. They help our plants and gardens grow nice and strong. Worms live in the dirt outside. When it rains, you will see worms all over. If you see a worm laying on the sidewalk, it's nice to put the worm back in dirt because worms can't get too dry. They need to stay wet from the dirt. They also like it when it's dark. That's why they stay underneath the dirt most of the time. Stand in front of the children with a few worms. 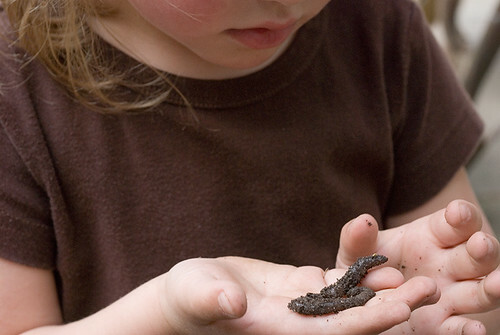 Show them all the wiggling, squiggling, and squirming the worm does on your hands. Let them know how fun it is to watch and feel the worms crawling around your fingers and hand. Next, pass the worms around so that each student has a chance to touch and feel the worms. You might also want to try painting with worms. Don’t worry, no real worms will be harmed in the process. The children will be using spaghetti noodles instead of real worms. After all that wormy talk and play, your little preschoolers might be feeling a bit hungry. At the end of the day, pass out small bathroom-sized cups of crushed up chocolate cookies (dirt) with a couple gummy worms inside, hanging out over the edge. 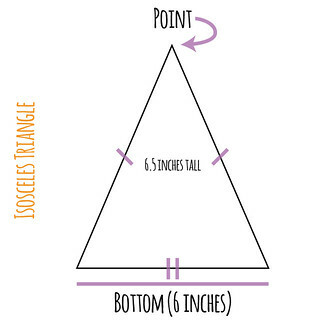 Whether your child is homeschooling or in traditional school, there comes a point when he or she needs to learn about the isosceles triangle. Here are free isosceles triangle learning resources, such as printables, lesson plans, and homework help. The isosceles triangle often is confusing. Students sometimes mix it up with other types of triangles, such as the scalene triangle. No matter if you are searching for free homeschool lessons to teach about the isosceles triangle, resources and games to re-enforce lessons, printable worksheets, or free homework help, the collection of links below should have what you need.